Beautiful Folk Art Mid Century Vintage Tribal Moroccan Rug, Country Of Origin: Morocco, Circa Date: Mid 20th Century – This versatile vintage mid century modern carpet from Morocco features a bold, tribal pattern with subtle touches of nature inspired design in the row of blue star shapes near the center. Even with its asymmetrical pattern, there is an overall impression of balance with the composition of shapes. Both ends of this vintage wide hallway rug feature a pattern with looser lines, showing more of the neutral background. 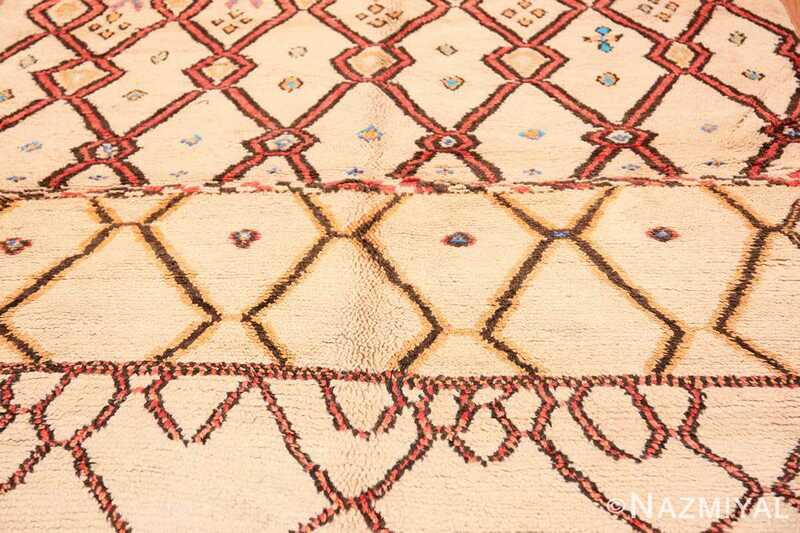 The pattern becomes more vivid with a tighter shapes toward the middle of the this Moroccan Berber rug with a concentration of pattern detail in the center. This folk art design pattern incorporates a variety of line styles in the dominant diamond pattern, with some sections of color within an outline and other sections of dark lines highlighted with color. 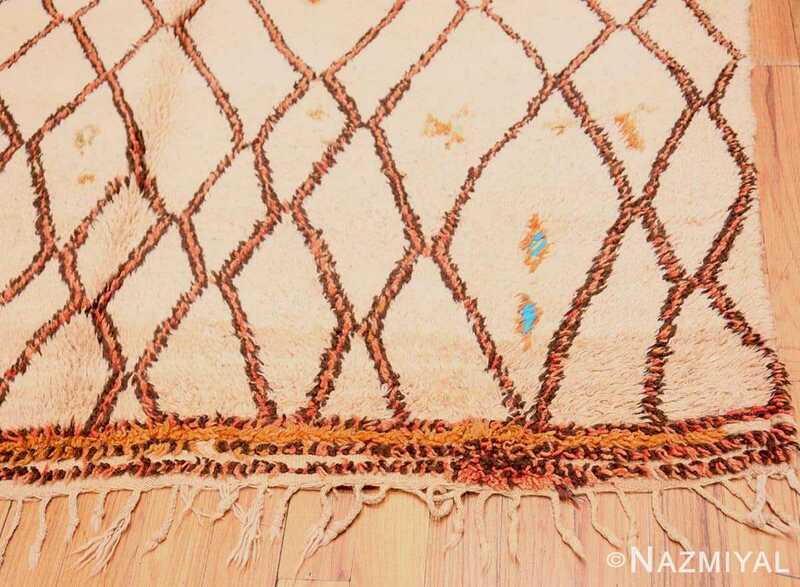 The stripes that border the sections are also diverse, ranging from intricate checkerboard patterns to a row of chevrons. 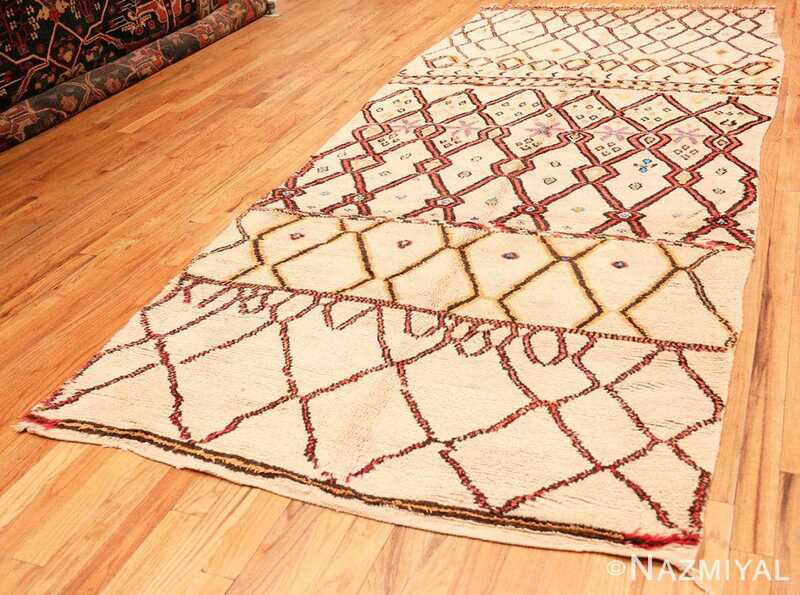 The neutral cream colored background of this one of a kind vintage Moroccan carpet is peppered with colorful triangular and kite shaped abstract dots, pleasingly arranged within the lattice of the dominant pattern. 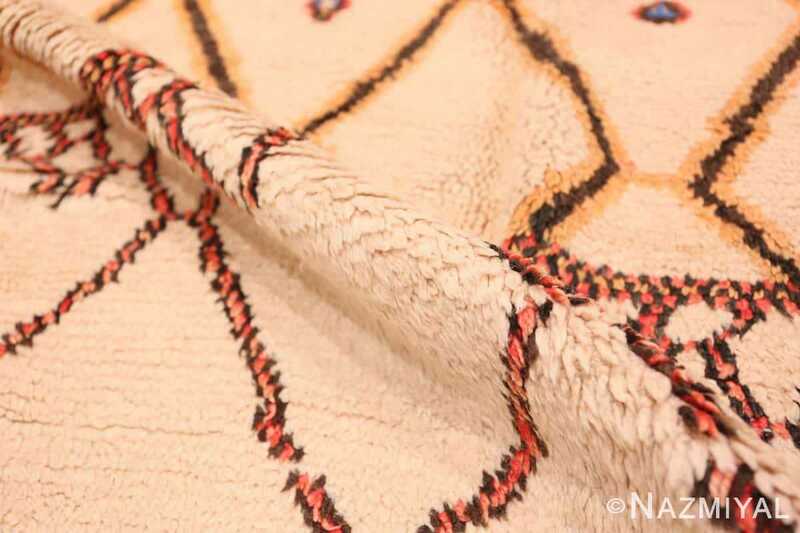 While this beautiful shag Moroccan carpet does not feature a boldly hued background, its artisans used bright color throughout for a subtle yet joyful color story. It is versatile with its color palate, but it maintains a point of view. 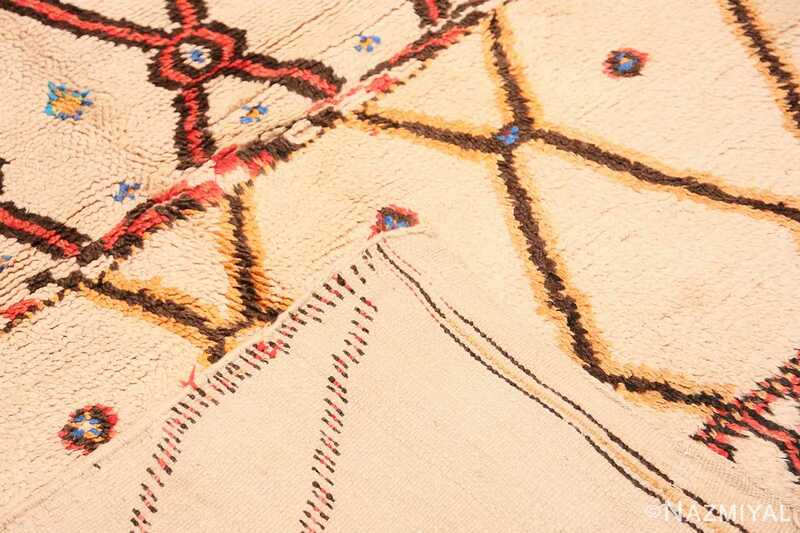 This unique folk art mid century vintage tribal Moroccan rug is almost symmetrical, but is actually asymmetrical. It is almost geometric, but also organic. Almost neutral, but also colorful. It is an artistic exercise of beautiful paradoxes. Tribal rugs such as this are quite versatile and can be incorporated in a variety of interior designs. 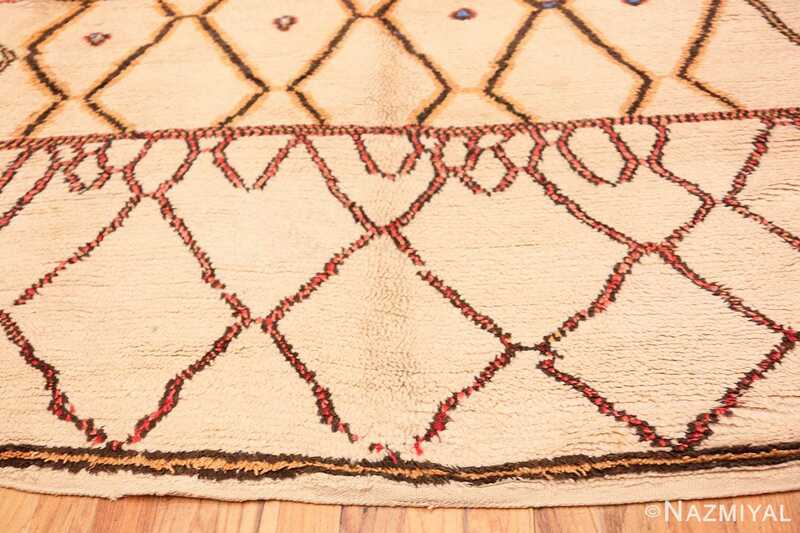 This specific folk art mid century vintage tribal Moroccan rug is a breathtaking example and is sure to garner much attention and love from those who see it.